Time flies really fast, we are already in the month of August now! What? This post is to share some of the money related tips (or lessons) that I've learnt personally during the trip and hopefully it is beneficial to you folks too, especially if you are planning for some upcoming free and easy trips (though some of these tips might not be new to you). When doing free and easy trip, transport cost is always one of the fluid cost that we need to take into consideration (or budget for it). Of course, with Uber coming into picture, it is more palatable as compared to the normal taxi/cab, especially in the European countries. Having said that, do take note that some smaller European city (like Sardinia, Italy that I've went to), Uber service is not available. So, you can either using their normal taxi service or public bus service. Lucky for us, their taxi service is not as expensive as in the big city like London or Paris. So, it is still palatable. When we were back to London and Paris, besides using the Underground (tube) service occasionally, most of the time we are using the Uber services. It is definitely a cheaper and more convenient option. Besides, I learnt that we can use Uber as a bargaining tool when negotiating with other similar private car services, especially those servicing the airport passengers. For my case, I managed to use the amount indicated in the Uber app and negotiate down with the driver from 80 Euros to 45 Euros (travelling from Charles de Gaulle Airport, Paris to our hotel). Oh, by the way, if you are having a prepaid SIM card with new phone number, do remember to change the telephone number in your Uber App so that you are remained contactable by the Uber driver, when the needs arise. Usually, for free and easy trip, we will need to arrange our accommodation prior to the trip. This tip is only applicable if you are arranging your accommodation at hotel i.e. Airbnb accommodation is not applicable. Most of the hotels in European countries will need you to produce your credit/debit card upon check-in for them to "hold" the room charges (plus extra 100 Euros/Pounds as deposit for other expenses). When you are checking-out, they will requires you to provide them the credit/debit card again for them to deduct the actual room charges (assuming you do not have any additional expenses during the stay, they will just charge the committed room charges i.e. without the 100 Euros/Pounds deposit) AND "release" the amount they hold upon check-in. Do take note that the amount they "released" is not instantaneous i.e. it depends on your credit/debit card provider's arrangement. For my case, I was using DBS Debit Card and I noticed that the "hold" amount has not been released upon my return to Singapore (even though the amount charged upon check-out already been deducted and shown in my online transaction history). Finding it odd, I made a call to DBS contact center to clarify and learnt that usually the bank will not automatically release the fund if the amount held is different from the amount successfully charged (remember the hold amount is 100 Euros/Pounds more?). So, with my call, they told me that they will help me to release the fund manually and even then, it is not immediate, it takes around 1 to 2 working days. 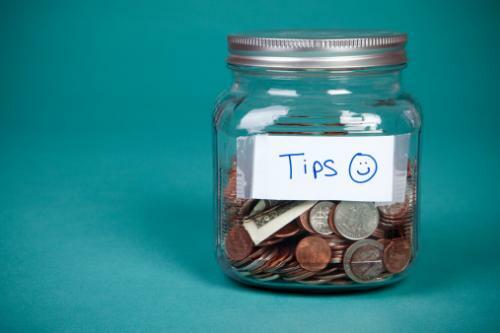 This tip has no savings or whatsoever but it is more for knowledge. Similar to accommodation, usually, we would have settled our flight arrangement much earlier prior to our trip. The key here is to read carefully the check-in luggage allowance of the flight tickets that you are about to buy. For my case, I've bought the British Airways ticket from London to Paris, I thought since it is not a budget airline, I conveniently assume that the usual check-in luggage allowance (20 or 25 kg) will be included. So, we learnt our mistake and bought the check-in luggage allowance online prior to checking-in for the return flight. In short, before hitting the confirm button when you are getting your air ticket, do counter check whether it covers the check-in luggage allowance, if "no", do remember to get it online prior to checking-in your flight, if you need one! Last but not least, our 52nd National Day is just around the corner, wish everyone an early Happy National Day!